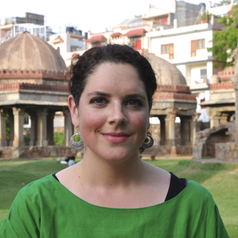 Georgina Drew is a Senior Lecturer (Assistant Professor) in Anthropology and Development Studies at the University of Adelaide in South Australia. Her work as an environmental anthropologist includes the study of water cultures, the relationship between religion and ecology, the political ecology of natural resource management, and contestations over climate change and sustainable development. She has published over twenty research articles and has a forthcoming book about the management of the River Ganga in India's northwestern Himalaya.